IC promotes an understanding of the interface as a historical and cultural phenomenon. IC strives to expose the implicit agencies, conditions and contingencies of interfaces, applications and apparatuses. IC does not require a generally accepted definition of the interface. IC encourages comprehensive and transdisciplinary perspectives. IC is neither interested in the enhancement of usability and mere ergonomic questions of design nor in the optimization of user orientation and user experience. IC actively seeks to expand these viewpoints beyond the western European framework and to include more female authors and contributors. IC invites submissions (original papers, project or artwork descriptions) in English and does not charge any author fees. 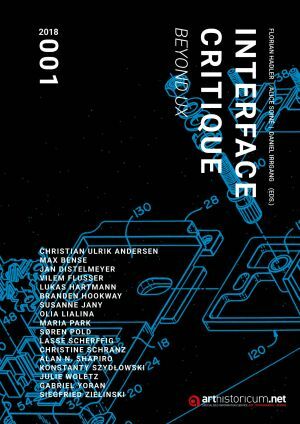 Please send an abstract of no more than 400 words to hello@interfacecritique.net. Please refer to the journal style guidelines and any additional information regarding call for papers on this website before the submission of a full manuscript. IC is also looking for unknown or forgotten texts and artifacts that haven’t been made public or haven’t been translated into English yet. These are welcome in any language and we will do our best to resurface them at least partially as long as we can obtain the publishing rights. Please get in touch if you know of something you consider worthwhile. IC is committed to open access. All of the articles are free to access immediately from the date of publication. IC is not funded and depends on the goodwill of its editorial team and the continuing support of its network.